The Old Burying Ground in Sag Harbor, NY has 334 known stones. Sag Harbor was once a huge seaport known on a national scale, although following the Gold Rush and economic bust of the mid-19th century, the town experienced a decline. 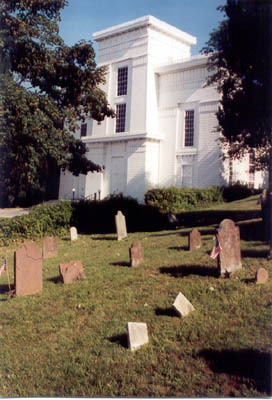 This graveyard was the main place of use during the town's heyday, with the first known internments occurring just before the Revolutionary War, and increasing until the currently used graveyard opened in 1840, due to overcrowding. The last internment occurred in 1870, with use tapering off until that point. The international flavor of the time is visible in the number of internationals buried within the graveyard. Extensive documentary information including names, dates, epitaphs, genealogical information and artwork were documented by the local Committee for Sag Harbor's Old Burying Ground. A committee member also drew a numbered map, linking the list of names to stones via numbering. The graveyard is divided into ten grids of somewhere around 30 stones. Ideally, this project would photograph all of the stones in one systematic method to document the markers. If the project permitted, GIS could also be incorporated to link the actual sites of the gravestones and the map to geographical data. Unfortunately, disintegration of the stones accelerated drastically in the last ten years, and committee members rightfully worry it may already be too late to get good quality images of all the stones. There are certain methods that could enhance the image, such as the application of water or mud to the stone during parts of the photographic process. Ideally, the website would capture images of all of the stones, and transcribe the documentary information contained on those stones. If the number of stones and deterioration were prohibitive and more detailed selection was required, the first grid contains several particularly informative stones, many of which are in better condition than others, and it would be a good place to start. Additionally, the website could contain some information about the town's history, including highlights focusing on early vacationers, those connected to the town's famous whaling industry, and some of the under-appreciated aspects of multiculturalism visible in the town's whaling days. Depending upon the mapping technology used, it would be particularly useful to document the trajectory of the fallen nearby Whaler's Church steeple through the graveyard, demonstrating some of the obvious damage caused when this happened in the 1938 Hurricane. In recent years, the town has returned to the limelight as part of the Hamptons, while causing great turmoil over questions of local identity and the role of outsiders. The graveyard offers a great opportunity as a community teaching tool, helping people recognize the town's previous cosmopolitan life and teaching newcomers about the identity old-timers fear losing. Much of the community's history is only available through word-of-mouth and randomly accessible tours. Creating a website with this much detail offers an opportunity for greater outreach. It also allows an opportunity for genealogists and family members who have lost touch with the town to reconnect, and to help a new generation of residents appreciate what their predecessors valued.